Easy Dinner time. 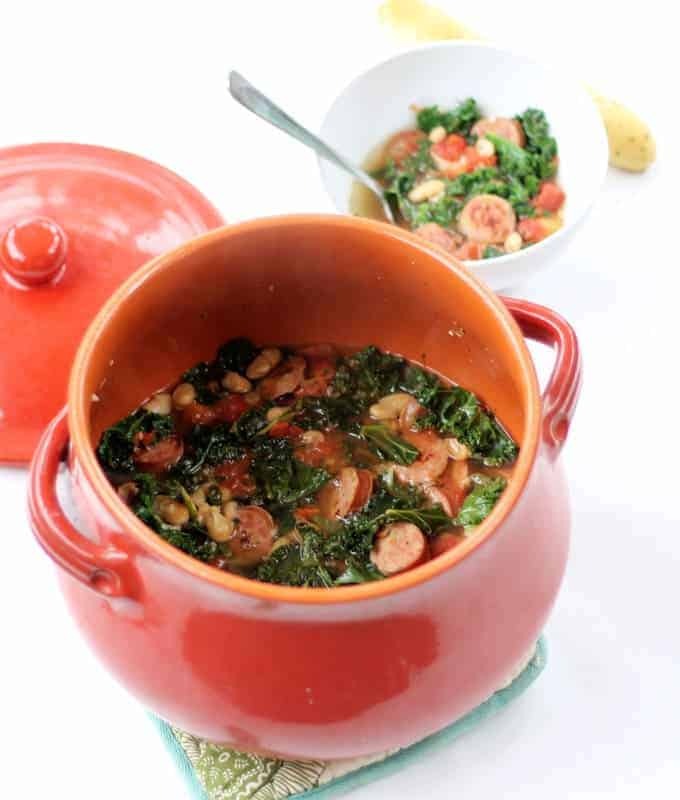 This sausage, white bean and kale soup is so hearty and healthy and flavorful, I make it all Winter through. 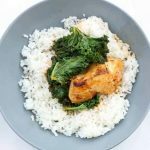 It’s easy to make for a weeknight dinner or for weekend company. I almost always have half a batch in the freezer. (Oh yeah, it also freezes well.) 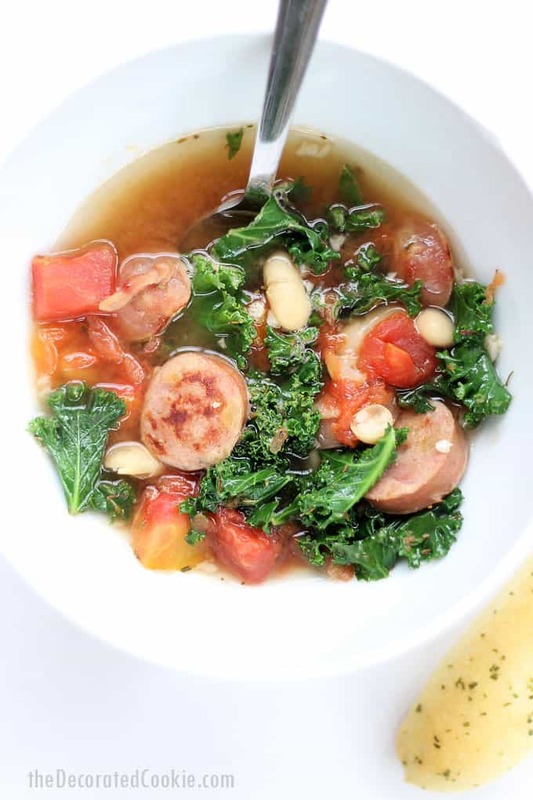 The apple in the sausage adds just the right amount of sweetness. Lastly, in listing its virtues, it’s versatile, so you can add more or less of the things you like. 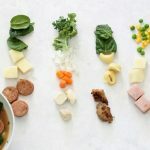 The temperatures are creeping up here in Washington DC, but last week it was cold and rainy and gray, so I was glad to have one more chance to squeeze in this soup when I was wearing long sleeves. Aside from the kale, most of the ingredients I have in my pantry all the time. A few notes, I usually purchase cans of diced tomatoes with no salt added and the low sodium chicken broth. I like to have greater control over the seasoning to taste. I do add a generous amount of sea salt and pepper, but at the end. You don’t want to salt soup too early or you can easily over do it. 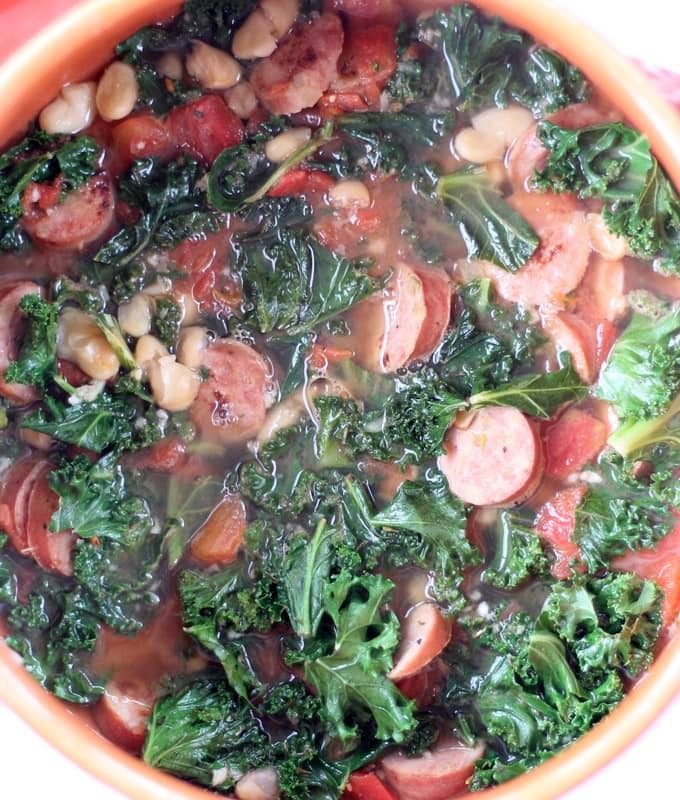 As I’ve mentioned before, I put kale in everything. Everything. And a lot of it. You can see above it’s pretty full o’ kale. 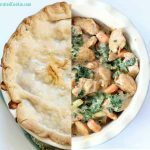 You may certainly add less if you don’t share this kale thing. Or try spinach instead. In the summertime, I use fresh thyme from the garden instead of dried thyme. I use a lot, too, because I like the flavor, but you can tone it down for yourself. I will also often use a combination of fresh tomatoes and canned tomatoes. Great Northern beans are a great substitute for cannellini beans, too. Sometimes I double up the beans for more protein. I’m a fan of hearty soups, but if you want soupier soup (is that a word? ), simply add more chicken broth and adjust seasonings to your taste. 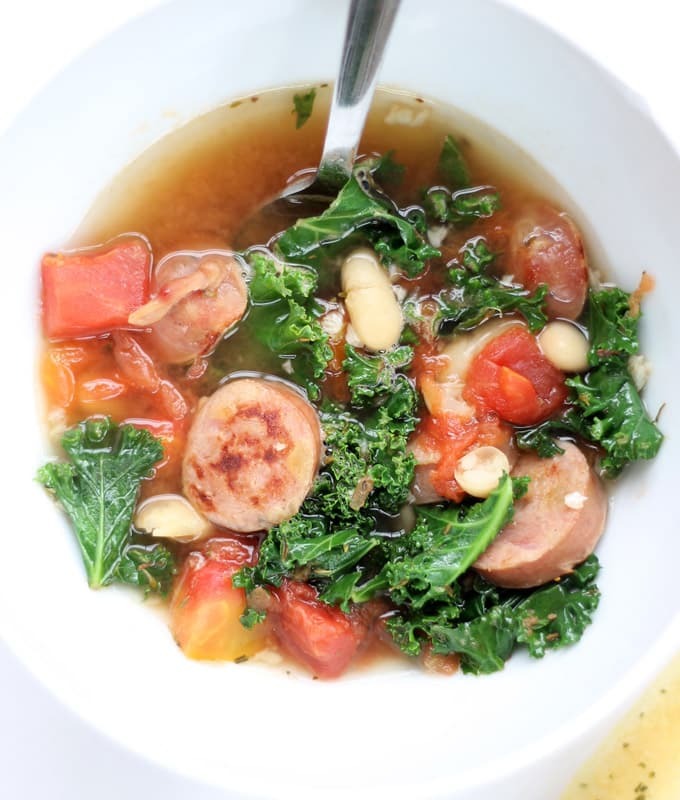 During the week, I serve bowls of this soup with store-bought frozen breadsticks. So good. Insta-meal. 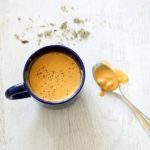 And by the way, if soup is your thing, be sure to check out this easy, four-can pumpkin soup, too. Heat 1 tablespoon olive oil in a skillet. Slice sausages in 3/8-inch slices and brown in the skillet, 2 to 3 minutes per side. Set aside. In a large pot, heat the other tablespoon of olive oil. Add the garlic and saute until fragrant, about 2 minutes. Add the tomatoes, beans, broth and thyme to the pot. Heat over medium high, covered, just until it comes to a boil, about 15 minutes. Stir in the kale. Heat uncovered just until the kale wilts but is still bright green, about 3 minutes.